Weekly Photo Challenge: Enveloped | Oh, the Places We See . . . If you drive down to the end of St. Pete Beach, Florida, past the historic and very pink Loews Don Cesar Hotel Resort, you’ll find yourself in charming Pass-a-Grille Beach. And it’s there on tiny Vina Del Mar Island that mailboxes — yes, mailboxes — make you smile. Well, at least we smiled. 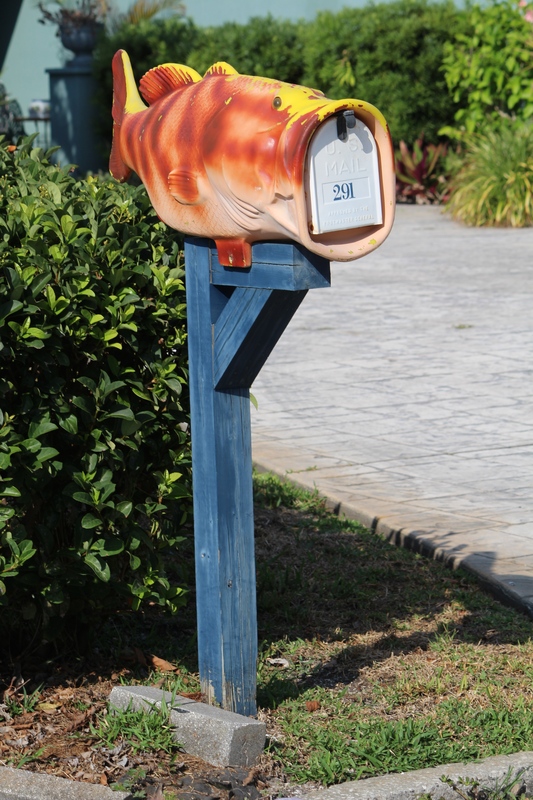 And we’re betting when you see how the U. S. Mail in this tiny stretch of America has been enveloped by sea creatures, you just may smile, too! Enveloped by a big-eyed sea horse . . .
And this one cuddled by a huggable manatee — while the little one looks longingly for the postman! Or how about being enveloped by a big ol’ wide-mouth bass? 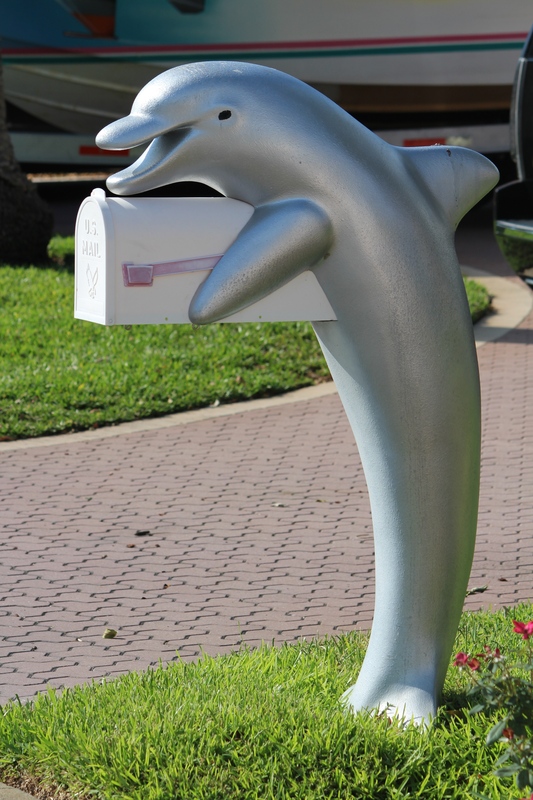 And last, this slick, silver dolphin proud to be enveloping a mailbox at the end of a Florida driveway. Totally enveloped now? Not even close. Check out more examples of this week’s word in the WordPress Weekly Photo Challenge: Enveloped. 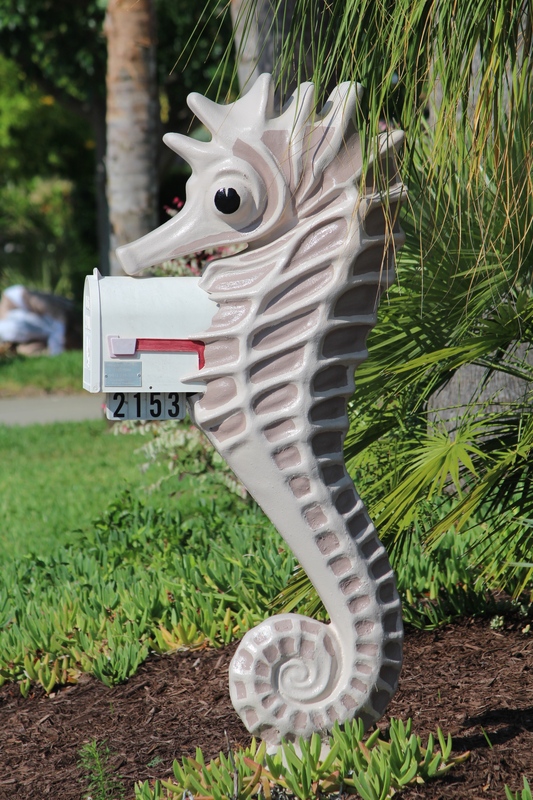 This entry was posted in Travel, Weekly Photo Challenge and tagged dolphin, enveloped, Florida, mailbox, seahorse, Vina Del Mar Island. Bookmark the permalink. This is such a cool take on, Rusha. It looks like I have missed all you recent post from my Reader. I will need to re-subscribe. Thanks for finding me. I always appreciate your comments. Best wishes for a good week! Thanks for taking a look and commenting. I’ve been without wi-fi for a week, so I haven’t responded to any of your posts. Looking forward to catching up, though. Best wishes for a good, long weekend and week ahead. Thanks, Judy. We loved this little neighborhood and couldn’t believe the mailboxes!! Isn’t travel wonderful? Judy, sometimes when I respond on my phone, the comments don’t get posted in the right places. 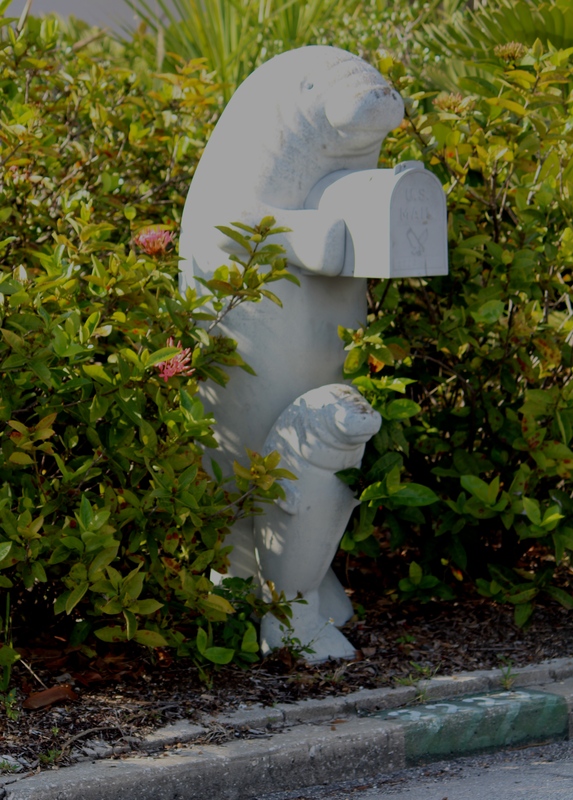 Just wanted you to know I appreciate your taking a look and smiling just as we did when we saw this cute mailboxes! Love traveling!